the all-natural sanitizing, Model A3, diffuses bee propolis into the air. The most powerful unit, Model A3 travels well, fits easily into a suitcase, protecting you from environmental conditions abroad. "Green clean" any home, office or clinic with the Propolis Vaporizer & Diffuser, Model A3. Plug it in, turn it on and a multitude of microscopic flavonoids are released into the air, killing bacteria and mold. This proven effect works as an all natural antibacterial, antiseptic, antifungal, antiviral agent. Model A3, with an integrated fan, is the most powerful model with a fan that cycles on and off every 45 seconds to diffuse propolis in larger open spaces of up to 645 sq. ft. (60 square meters), making it ideal in a large family rooms, offices or conference centers. It ships with 1 capsule, each lasting 122hr or about 5 days of non-stop usage. PROMO - 1 FREE BOX OF REFILLS INCLUDED! It's low-profile form is made of plastic, making it easy to clean and very portable. 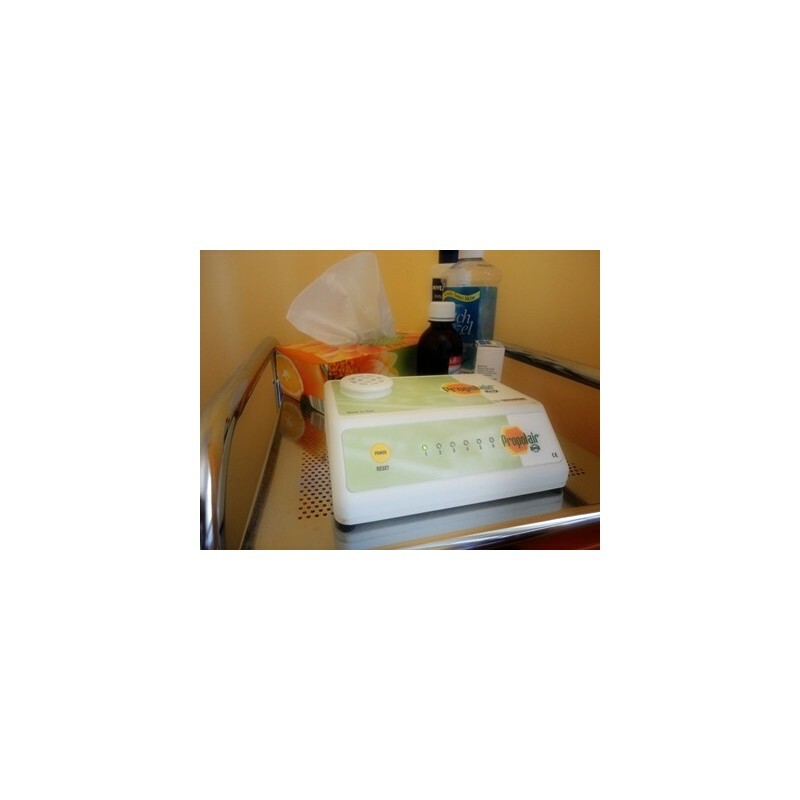 The size of a facial tissue box, it makes an ideal companion when staying in hotel rooms, sanitizing the room of bacteria, mold and even acariens. With a built-in ionizer, the negatively-charged particles of propolis rapidly adhere to surfaces, the nasal mucous membrane and to the volatile particles which have a damaging effect, such as tobacco smoke, house dust, viruses, bacteria, mold spores and mites. In fact, the ionizer works even when the vaporizer is turned off. > reduced bacteria in the air by 71.8% in 3 days! In numerous experiments conducted by the ASL of Collegno (Italy) in a classroom showed that the molecules of propolis, thanks to their acknowledged antibacterial, antifungal and anti-inflammatory properties, inhibit bacterial and microbial presence. Moreover, the negative ionization led to an increase in the movement of bronchial cilia, thus favouring a concentration of propolis targeted at the respiratory tract. > improved attendance up to 60% with propolis vaporizers. Click here for a copy of the letter from the director of the day care center. For the human condition, a propolis vaporizer is the perfect natural solution to aid those with respiratory ailments and protecting and boosting the immune system. Best of all, it is totally complementary with other treatments. 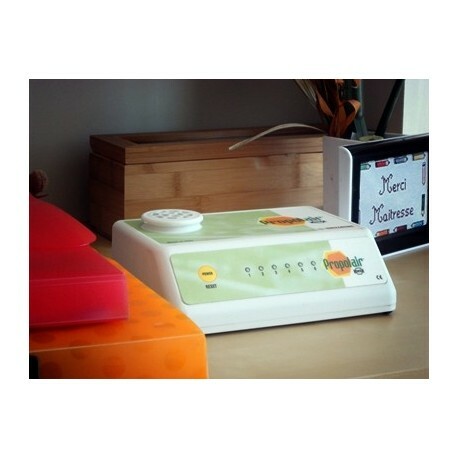 Having a propolis vaporizer in your environment is a very positive addition to any home, office or clinic. I personally prefer the car vaporizer, as propolis is more directly concentrated inside the car and I can breath it while driving everywhere when I have any respiratory problem. But, of course, all vaporizers are effective and I recommend them." “To treat children successfully, we have to use anti-mold strategies. To a large degree, I don’t use medical drugs. 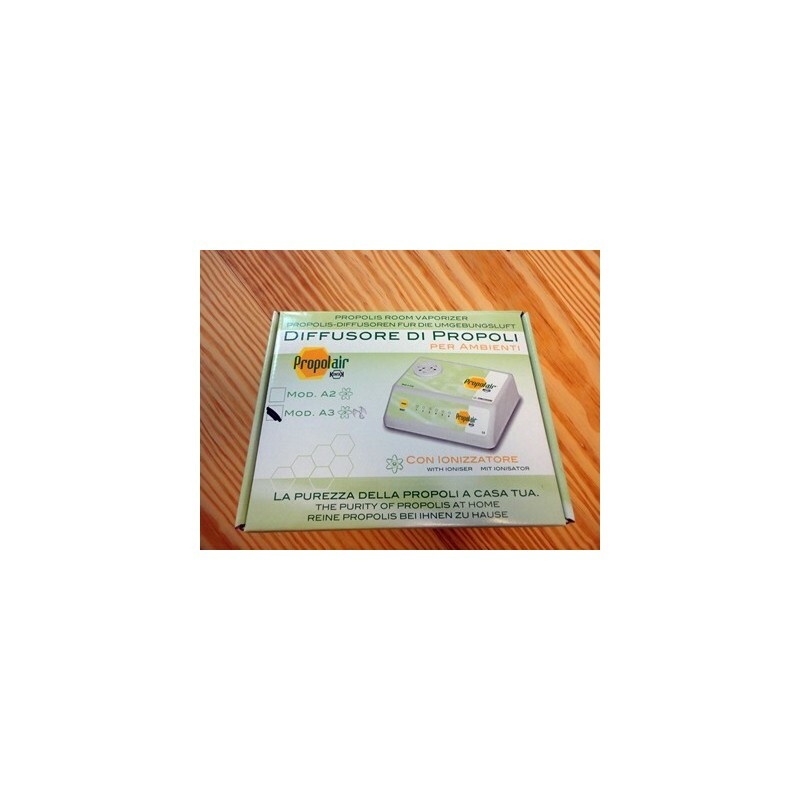 The propolis vaporizor is a strategy to make the house mold free. An Italian study showed that if you vaporize propolis at 82.3 C, it creates a monoatomic vapour of propolis in the house that kills every single living microbe in the air, making homes safe for the children. It’s a fantastic tool. It’s inexpensive, and has transformed the lives of alot of kids. An Italian asthma study shows over 70% asthma cures in 6 weeks with kids. 70% asthma cures! There’s not much that matches that result. 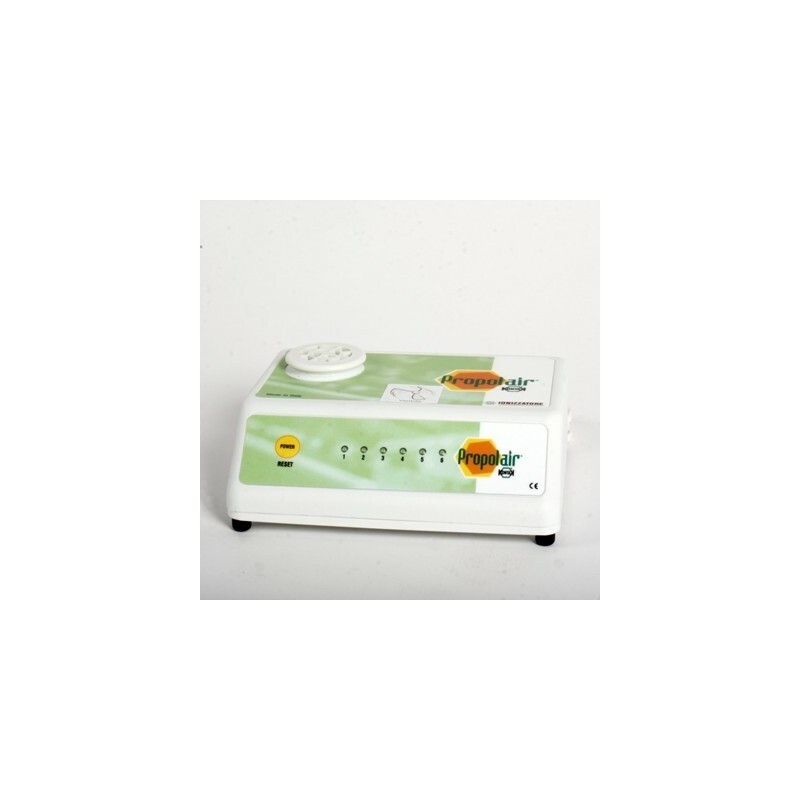 The Propolis vaporizer is a big part of my anti-mold strategy”. In separate laboratory studies, the diffusers dramatically reduced air pollution, such as benzene and hydrocarbons, from 15-70%! Click here for a full pollution reduction report. 1) photo on left was an airborne sample of my 1999 Saturn's air (while driving). 3) the mold test kit can be purchased at Home Depot for $10, it is called Mold Testing by ProLabs (also can be ordered on the Internet, but you have to pay extra for shipping). 4) photo on right was taken after using the propolis for two days. Absolutely no evidence of any mold growth, not even a small pin-sized colony. A month earlier, I did the same test in my wife's car, and got rid of the airborne bacteria. I could not believe it, so I tested twice, still no mold growth. Furthermore, since we ran out of the first little container of propolis (i.e., vaporized it into the car interior), I tested her car again after one month of non-use of the propolis, an still no evidence of airborne bacteria mold growth. Evidently the stuff gets stuck in the car's air circulation filter and keeps on working. I will keep testing every month until I get some evidence of bacterial growth. And I will let you know my results. Click here for more information on the research conducted on Propolair vaporizers and Italian propolis. I'm so happy with the results I have been getting from using this vaporizer. I no longer am getting my normal stuffy nose or scratchy throat. I have a holistic health care practice where it is important to me that my clients have the best possible environment to heal. 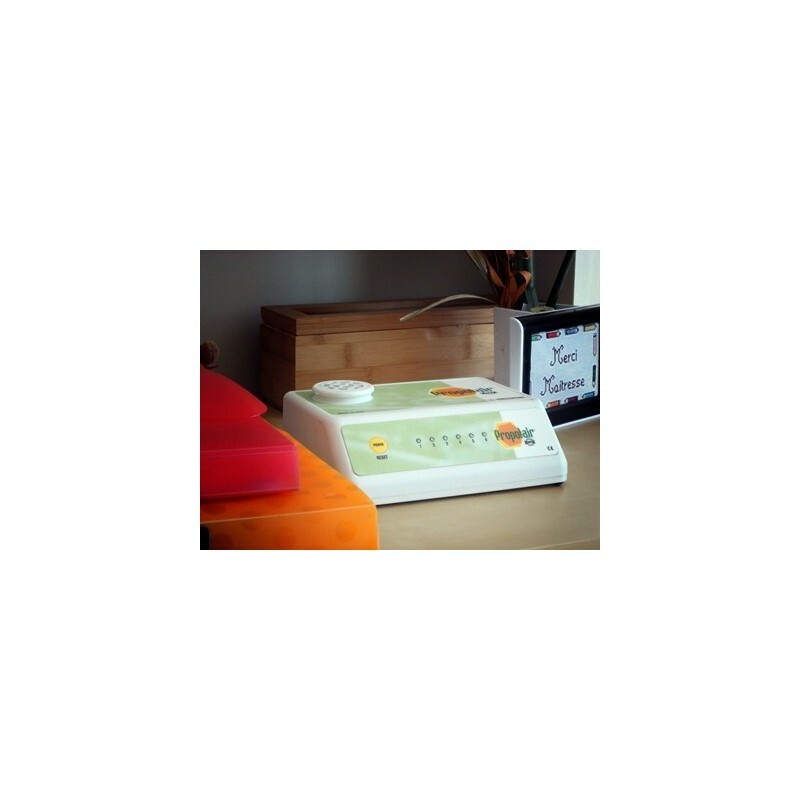 The propolis vaporizer has been a wonderful addition to my office and therapy room. Not only do my clients get the benefit of a bacteria, mold and virus free place to heal, the vaporizer is boosting their immune system at the same time. All my clients comment on how fresh the air is. They also notice how easily they breathe in my office. One of my clients went home and purchased a vaporizer because of her husbands breathing problems at night. She said he stopped coughing the very first night. Nothing before had helped. For me, working in such a delightfully clean environment has provided me with all the benefits my clients are enjoying. I'm a better practionioner, because I feel better. I would recommend this to anyone, even if you think you're healthy. This is an easy way to boost your immune system and to deal with the environmental contaminants, strange flu strains, microbes, viruses and mold spores floating around that you can't even see. I have placed several vaporizers around my home. I missed that wonderful air when I left my office.